Tollywood Filmmaker SS Rajamouli's epic fantasy drama Baahubali:The Conclusion is the most awaited Indian film of the year without any doubts. While Indians all over the world is eagerly waiting to witness the trailer of Baahubali 2, finally the trailer is being launched today morning. In an interview with a vernacular channel, Rajamouli told that the highlight of the second installment is the war between Prabhas and Rana Daggubati. In 2015,big budget movie Baahubali: The Beginning released and was highly successful and grossed a whopping Rs 600 crore worldwide. 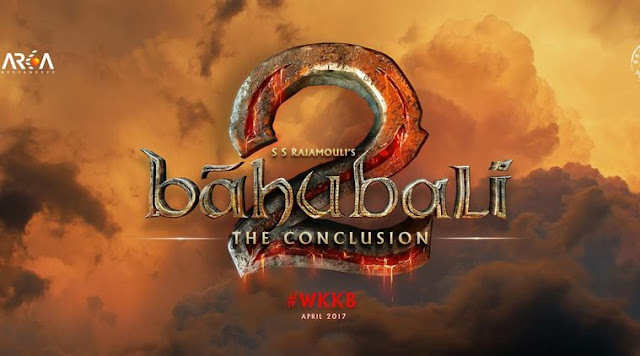 But this time the final installment Baahubali the Conclusion was made on a budget of Rs200 crore, reports says that Baahubali 2 has already raked in Rs 500 crore globally through its satellite and distribution rights way before the movie release. The trailer starts with voice over by Amarendra Baahubali(Prabhas) who swears to protect the wealth, dignity and life of Mahishmati people-his people.But he was stabbed to death by Katappa, the birth of Amarendra Baahubali's heir Mahendra Baahubali aka Shivadu. That follows the montage of epic war between Shivadu and team with the evil Bhallala deva. The entire trailer is full of action (what we all the fans have already expected), intense drama and some brilliant visual effects. The bottom line is exceptional is a small word, the makers had made the second installment of the Baahubali series bigger, better & grander. No bets it will cross the biggest grosser of Indian cinema.